Welcome back to MangoBot, a biweekly column about Asian futurism by TokyoMango blogger Lisa Katayama. My childhood hero was a purple-haired robot who spends all her free time poking poop with a stick. Like all good Japanese children, my formative years were influenced by manga robot heroes-two-dimensional, two-legged machines that first existed in simple black-and-white on newsprint. These robots quickly evolved from inanimate drawings on paper into animated TV stars, and later spawned franchised products, movies, video games, and major museum exhibits. One even transcended man-machine boundaries to become the first robot, feline, and two-dimensional figure to become an officially recognized global ambassador. Amazing. Here's a quick list of four anime robots that played a huge role in making me into the human I am today. Who he is: A doe-eyed robot with jet engine feet, eyes that double as searchlights, and a nuclear reactor heart, created by manga godfather Osamu Tezuka. Lessons learned: 1. Robots are smart and good. 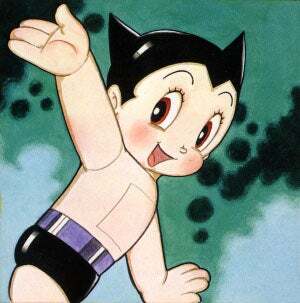 (Astro Boy had decision-making skills and a heroic conscience built into his circuitry.) 2. International politics: nuclear power is only dangerous if used maliciously, or if there's an accident. 3. Optimism goes a long way even when your world is being ravaged by war. Who he is: A blue robotic cat from the future that appeared out of accident-prone schoolboy Nobita's desk drawer. Doraemon has a treasure trove of secret weapons in his four-dimensional built-in fanny pack-everything from candy that makes you tell the truth to an ATM machine that recycles used goods for cash. In March, Doraemon was chosen to be the Anime Ambassador of Japan by the Foreign Ministry. Lessons learned: 1. Don't be afraid of bullies. 2. Travel as much as you can-whether it's through a teleportation door, with propellers on your head, or on a time machine. 3. Just because you look different doesn't mean you can't be best friends. Who she is: A purple-haired, near-sighted girl robot built by a kooky professor named Norimaki Senbei (seaweed-wrapped rice cracker) to resemble a real 13 year old human girl. She was created by Akira Toriyama, the same genius manga artist who wrote the Dragon Ball series. Who he is: A cockpit-operated "mobile suit" from a world called UC (Universal Century). Some would argue that Gundam is technically not a robot, but it wouldn't be fair to exclude him from this list because of his importance in global humanoid machine history. Lessons learned: 1. War is inevitable. 2. Bigger is sometimes better. 3. There are other universes out there, and one day we will all live in outer space.